Wind Turbine Syndrome | “Big Brother” Wind? 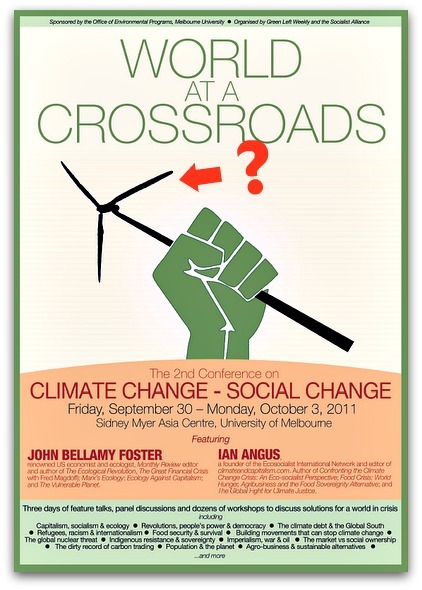 Notice this announcement for the Second Conference on Climate Change/Social Change (Australia, 9/30/11–10/3/11). Above all, focus on the clenched fist. Notice WTS.com’s question: “A wind turbine wielded by that familiar-looking fist?” The response from the keynote speaker? 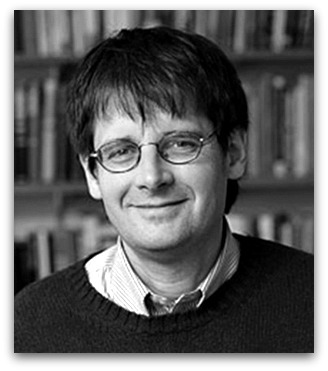 “A global ecological revolution can only occur as part of a larger social revolution“—John Bellamy Foster. Editor’s note: I am well aware that the “clenched fist” salute has been used by many social movements, including the 1960s campus “radicals.” (My college era. University of California. Riots.) I am well aware that it stands for “solidarity” and “smashing” the power of those in control—whether it was the university administration or any other form of oppression (as perceived by the people with the clenched fist). 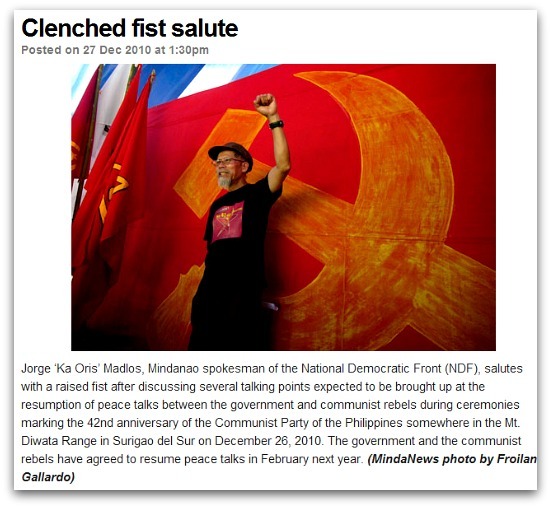 Be that as it may, the “clenched fist salute” has been traditionally associated with (and cheerfully adopted by) Communism—as in, a forced social “cleansing” and “reform.” Emphasis on the word “forced.” Emphasis on “violence,” which is what a clenched fist has always stood for since the beginning of humanity—whether it was my angry father or the campus radicals. 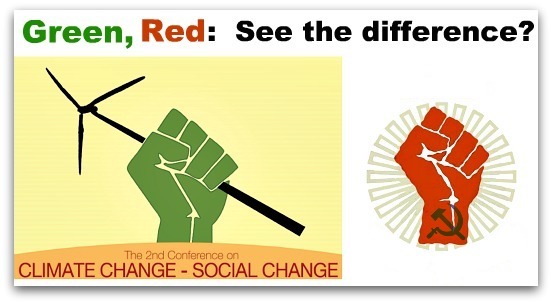 You are welcome to remove the hammer and sickle from the image, “Green, Red, See the difference,” if you prefer to imagine a clenched fist associated with some other “cause”; nevertheless a fist remains, and it is alarming to see it used as the symbol of the Climate Change/Social Change Conference. Clenched fists, whether Green or Red or Black or Female or Male or Worker or what have you, always have been a gesture of violent defiance and violent “reform.” As a professional historian who has published books (here and here) on the Philosophy of History, I can say categorically that no violent “reform” was ever worth a damn in History. Ever! 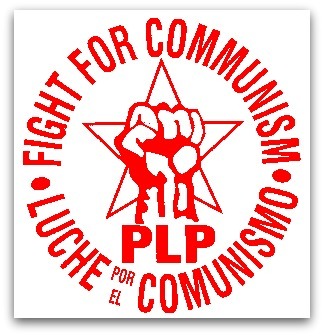 To the “clenched fist” Greens, I say: No fists! When you raise your fist, by definition you have corrupted your cause, making it as evil as your “enemy.” Violence—the historical record is replete with confirmation—is its own end. 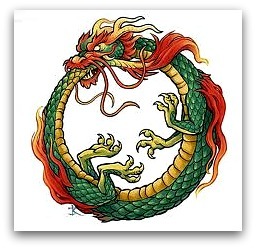 Violence is the dragon that devours its tail. This was highlighted at the Election Now Rally held in Perth, Australia on 18th September, 2011. Have the socialists who fantasize about de-industrialising our economy become complacent and let down their guard by using Soviet imagery? Or are they emboldened, gung-ho and brazen? Maybe they think that history is now on their side and they can start to show their true totalitarian face. I find it chilling. We had some nasty experiments in the 20th century with socialism: the National Socialism kind which produced the Nazis; and the International Socialism version which gave us the Soviet jackboot and crushing Chinese communism. Between them they were responsible for about 120 million deaths. Not a bad tally for a sick ideology. And just think about those windmills, which perversely, to deep greens are objects of beauty. They violate some of the sacred tenets of environmentalism: They industrialise the countryside (and the oceans near coastlines) on a grand scale. They kill birds (some of them endangered species) and bats in great numbers; and those towering monoliths cause serious human health problems, not least due to the insidious effects of infra-noise. Why would the eco-nazis allow such violations of these once sacred principles? The answer is that they don’t actually have any principles. They just have ideology. And ideology is a movable feast as seen in the party machinations of Soviet Russia (where a national hero one day could become a traitor to the state the next and be summarily executed). In these shifting sands no-one can be sure of anything (as satirised brilliantly by Orwell in 1984). So we now discover that windpower (and ridding our energy-based economies of coal power) is higher up the totem pole of hierachies than keeping industrial installations out of the countryside, or protecting birds (especially endangered species) and bats or stopping industrial installations from causing public heath problems. Who could have known this? Certainly not the left-wing greenie automatons who had to wait to be told that windmills are a Good Thing and trump these other erstwhile serious concerns. The automatons can now safely junk concerns about 300 foot industrial monsters creating visual pollution on a grand scale in the countryside; they can junk concerns about bird and bat kills; and they can junk concerns about deleterious effects on human health. And they can do so safely, with the warm inner glow that moral vanity and moral righteousness imparts to them. Long live the windmills and hail to the green ideology say the self-styled ‘progressives’ and socialists. It makes me a ‘good’ person. I am always on the right side of history and morality – and best of all my ego is stroked as I am accepted by my peer group and my narcissism is sated. It’s a beautiful thing.